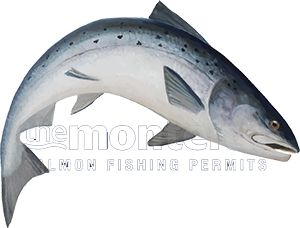 It's important you develop the skill of being able to 'read' a salmon river to determine exactly where the areas of a pool are that would suit salmon to 'hold' in. This is a skill that needs to be developed due to the 'ever changing' water conditions you'll be faced with on a salmon river which will continually move these salmon holding areas around. Take a look at this photograph and you'll note that the 'red circled' salmon holding area is located well back from the turbulent water that's visible to the right hand side of frame. This turbulence is created by some large sub surface riverbed stones. Salmon don't like turbulent 'boily' water and much prefer a steady relaxed flow to hold in. A salmon likes a steady water flow for its oxygen supply that's coming in through its mouth and out of its gills from the one direction and not the inconsistent flow that's present in turbulent water. If you can add into this steady relaxed flow pace some reasonable depth or at least close to an area where there's some pool depth for security should a predator show up then you've found an area that will hold salmon. Other salmon holding areas will often be far less noticable and especially in deeper pools where you'll only be able to evaluate the pool's salmon holding qualities after studing the water far more carefully. I recall a brilliant salmon lie on one of the River Tay salmon beats I used to work on. This particular salmon lie seemed to often produce heavyweight salmon and I recall a 36lbs & 31lbs salmon as 2 examples of this. Big salmon like the deepest pools to hold in when river water levels are running low. They clearly feel safer in this type of holding water until the next spate encourages them to move on again. So if you're looking for a chance of a big salmon in low water conditions go to the deepest pool on the beat you're fishing on. This above particular square metre salmon lie was only identifiable if you sat on the riverbank and studied the surface of the river at certain water levels. Although a deep slow moving pool if you really tuned into it visually you'd see a tiny dimple like swirl appear on the river surface every 90 seconds or so but so subtle it would be very easy to miss it and completely invisible if there was any surface wind riffle present. That swirl of water marked the presence of a big riverbed stone that was positioned approx 25 feet upstream of where this water displacement was ocurring. Beside this big deeply positioned sub surface stone is where all these heavyweight salmon had been hooked. It really is a fascinating aspect of salmon fishing as to the subtlety of where salmon prefer to hold and one that merits much thought and observation. Developing the 'nose of an otter' in Scottish salmon fishing is far more important than being a great caster with a fly rod as while the expert caster will be self gratifying themselves with the arial performance of their fly line the salmon fisher who's 'reading the river' correctly will likely have a buckled fly rod!